I never expected to be sitting next to an international legend. I never anticipated meeting a footballer whose career spans the iconic Spain's national football team, FC Barcelona, Atlético Madrid, and my team, New York City Football Club (NYC FC). I certainly never believed I would meet a footballer who has made THREE World Cup appearances, including earning the prestigious title of World Cup champion in 2010! Simply put, I never expected to be watching the World Cup with a World Cup athlete. When McDonald's initially selected me to be the recipient of an "unforgettable morning surprise," I was stunned. I was simply immersed in capturing the play by play of the excitement, and engaging with fellow World Cup viewers and football fanatics. Consequently, I was thrilled when I learned that my social media interactions had caught the eye of a global corporation. On the morning of the surprise, I was nervous, as I did not know who to anticipate at my doorstep. A huge crew was flown in to New York City to capture my reaction. The viral video, (shared by both McDonald's and David Villa on social media! ), says it all. I heard a knocking at my door, and when I opened it, a wave of disbelief hit me. Standing right on my doorstep in my small town in Staten Island, New York, was the captain of the NYC FC. I had first seen David Villa play live three years earlier, Spring of 2015, and remembered receiving goosebumps knowing I was in the stadium with one of the world's biggest icons. Now, here he was, greeting me by name and delivering a personalized McDonald's breakfast. I started chatting with David Villa, fully expecting a quick meet and greet at my doorstep. I even spoke a little Spanish (once I regained my composure). 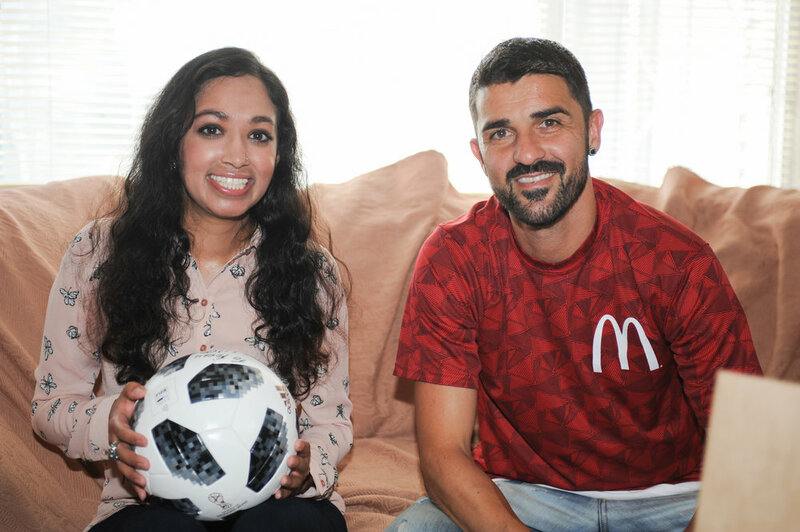 However, the McDonald's team arranged for David Villa to come inside and watch the World Cup game that was streaming in my living room! Was David Villa really sitting on my couch and watching the World Cup with me? This once in a lifetime opportunity was mesmerizing, to say the least. Once inside, we discussed the current game's predictions, the potential outcomes of the World Cup tournaments, his move to New York City in recent years, his time in the NYC FC and current grounds at Yankee Stadium, as well as speculation of an NYC FC stadium. We spent a full hour hanging out, enjoying the McDonald's breakfast, and chatting about so many different aspects of life and football. David even signed a FIFA World Cup Official Match Ball for me. As he left, I wished him luck on his career path and told him I'd continue to follow it! David Villa is truly a humble and grounded icon- incredibly down to earth in his interactions. I have so much respect for his work with the youth, his active engagement with fans, and his commitment to NYC FC. He is dedicated to his training, and in fact, he was headed up to training (NYC FC has a new training facility in Orangeburg) right after his Staten Island visit. Thank you McDonald's for truly creating the most magical and memorable FIFA World Cup experience of my life!!! I will treasure these moments for future World Cups to come. Signing the official FIFA World Cup match ball! Check out Better Display Cases' feature on my ball here! Catching the World Cup game!